Whether purchasing a car for the first time, a home for the first time, or anything for that matter for the first time, it can come with much confusion, a high level of uncertainty, and even some stress. The home buying process is often seen by many as a “daunting” process. This doesn’t have to be the case though, if the proper preparation and research is done. Here are several first time home buyer tips and some advice to help make the process of purchasing a home for the first time much less stressful and seamless! Not only is it important for a first time home buyer to know how much they can afford, but it’s also important to understand the difference between a pre-qualification and a pre-approval. First and foremost, a pre-approval is more attractive to a seller than a pre-qualification. A pre-qualification is a quick and very general overview of a first time buyers financial situation. The information used for a pre-qualification is usually given to the lender by the potential mortgagee, which can often be inaccurate. In addition to the general overview of the first time buyers financials, the lender usually will pull a credit report to make sure the credit scores are within the required guidelines of the different loan programs. A pre-approval is a detailed look into a first time buyers financials. It includes a lender pulling a fact data (Tri-merge) credit report, collecting the first time buyers pay stubs, W-2’s, verifying their employment, and any other information needed to approve the buyer. This process may sound much more difficult, but depending on the lender that a first time buyer chooses, it doesn’t have to be! Having a pre-approval instead of a pre-qualfication is not only attractive to a seller, but also can be the difference in a first time buyer winning in a multiple offer situation! Set Realistic Expectations when purchasing your first home! Buying a home with no expectations or goals in mind is no different than going to a grocery store with no list or budget. By going to a grocery store with no idea what will be purchased often will end up in lots of wasted time walking around aimlessly and ultimately not getting the results that would be expected. By having that strong grasp on the style of home, the size of a home, and other characteristics that are desired in a home will save a first time buyer lots of time and also ensure they are purchasing their first home while staying within the range of what they are able to realistically afford. It makes no sense for a buyer who is pre-approved for a loan amount of $150,000 to look at local luxury homes. A great real estate agent should be able to help a buyer set realistic expectations. The home buying process is exactly that, a process. There are certain steps that need to be taken to ensure the process of buying a home for the first time, goes smooth. By understanding the process, it greatly reduces the chance that a buyer is disappointed, let down, heartbroken, or frustrated. There are many things that a first time buyer should be doing before looking for homes, such as getting a pre-approval, but also many things that a buyer should be doing once they are under contract on their future home. Many first time home buyers don’t understand why it generally takes 60 days from contract to closing. Understanding the local real estate market is important when purchasing your first home! When purchasing a home for the first time, it’s important a buyer understands the local real estate market. There are many ways this can be accomplished. The internet has completely changed the way the real estate industry works in 2014! There is so much information available on the internet that can certainly help a buyer understand the local real estate market. The internet is great for providing a wealth of information, however, it’s also important a buyer understands that not everything that is on the internet is true. Really it isn’t! There are many third-party real estate websites on the internet that provide some very inaccurate information. A perfect example of inaccurate real estate information are the “Zestimates” that Zillow provides to consumers. The inaccurate information provided by these third-party real estate websites is not only specific to the Webster, NY real estate market. The best place for a first time home buyer to get educated on the local real estate market is by a local real estate professional. If someone was looking to have a dental procedure done, they wouldn’t go on the internet to look how to do the procedure or call their chiropractor. They would call a local dentist for their assistance. A person in Rochester, NY who is in need of a dental procedure would have no use for a dentist in Grafton, MA. The same can be said for a first time home buyer. A first time home buyer in Grafton, MA should not be looking to a Grafton, MA real estate agent for information on the Rochester, NY real estate market. It is important for a first time home buyer sit down with an experienced and knowledgeable local real estate agent to ensure they have a strong understanding of the local market! Buying a home is a very large event in life. It’s not something that should be done without the help of a trained real estate professional. There are many things that a real estate agent is responsible to ensure are getting completed accurately and timely throughout the transaction. Ensuring a buyer has secured a pre-approval from a reputable lender, ensuring contract dates are being followed, and negotiating on the buyers behalf to get them the best price for a home are just a few items that a buyers real estate agent is responsible for! Without this guidance, it’s very easy for a first time buyer to make a mistake that can cost thousands of dollars. There are many questions that a first time home buyer should ask a real estate agent, before selecting them! It’s common and understandable that a first time home buyer has more questions than someone who has purchased 5 homes. So, would it be a good idea for a first time home buyer to select a part-time real estate agent? Probably not! To be a successful real estate agent, there are many long days (and nights), which many times cannot be accommodated by a part-time real estate agent. In addition to whether an agent is part-time or full-time, other great things to ask a real estate agent is; How many sales do you complete a year? In what ways can/do you communicate? Can you provide me with some references or testimonials? There is often a general consensus that the real estate profession is one that can be done by anyone and that it’s “easy-money.” This is very far from the truth. There are people entering and exiting the real estate profession on a daily basis. This is why it’s extremely important that a first time buyer asks any potential agent that they are thinking of selecting these difficult questions. First time home buyers are often able to take advantage of first time home buyer grants or incentives. It’s important that a first time buyer understands that every lender is different. From the interest rate they are able to offer, the type of loan products they offer, to the incentives or grants they are able to offer. A lender who may not offer a grant to first time home buyers, may never mention it. When selecting a lender, it’s a good idea for a first time home buyer to research all of their options. It sometimes is a good idea to reach out to a local real estate professional before locking into a local mortgage lender. A great real estate professional should be able to understand a first time buyers situation and be able to suggest reputable companies who may offer the best type of product and/or grant for that buyer. Consider all expenses involved in owning a home! Many first time home buyers make the mistake of not considering the costs of owning a home. It’s common that a first time buyer purchases a home that is the absolute maximum they can afford according to a lender. This can lead to problems once the buyer realizes the other expenses involved in owning a home. First time home buyers often forget about additional expenses of utilities, furniture, appliances, insurance, and groceries, to mention only a few. A first time buyer who doesn’t consider these additional expenses often will have to change their lifestyles, which can be difficult for some. Instead of living with mom and dad who had cable TV and high-speed internet, they may now have to live without these luxuries. Bottom line, a first time home buyer must consider all the expenses and possible changes to their current lifestyle that may occur once owning a home! 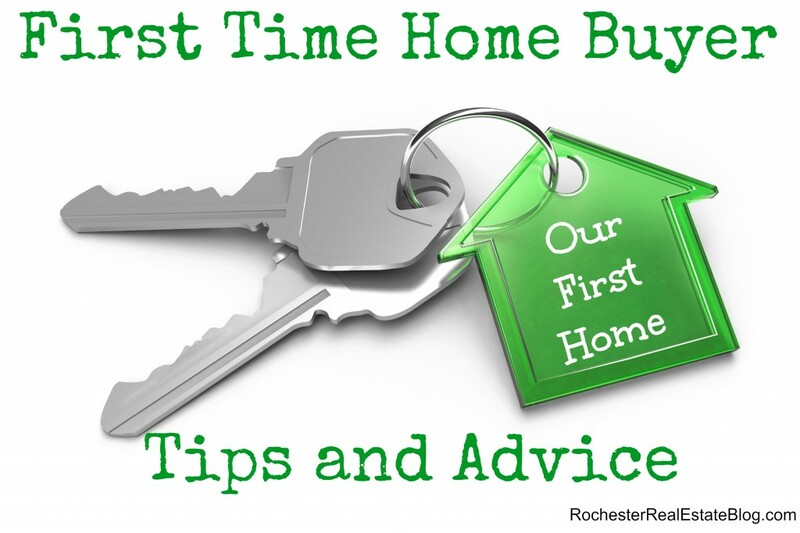 Are you a first time home buyer in the Greater Rochester, NY area? Contact us and we’d love the opportunity to explain the home buying process, educate you on the local Rochester, NY real estate market, and help find your “dream home!” We love first time home buyers! About the authors: The above article “First Time Home Buyer Tips and Advice” was provided by the Keith Hiscock Sold Team (Keith & Kyle Hiscock). With over 30 years combined experience, if you’re thinking of selling or buying, we’d love to share our knowledge and expertise. © 2014 – 2017, Kyle Hiscock. All rights reserved.